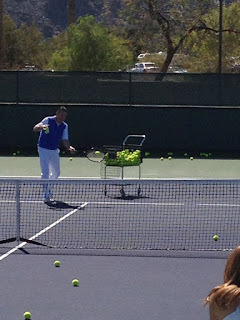 A dozen people were treated to something priceless ... a group lesson with legendary star Jimmy Connors. All we could do was watch from next to the practice courts at Indian Wells Tennis Center. Note, one of the great features of the BNP Paribas Open is the practice courts. It's possible to get up close and watch your favorites work out with their coaches.